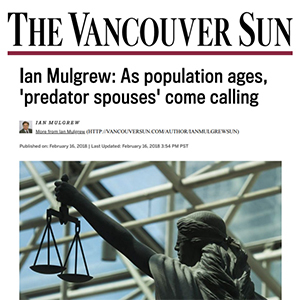 With over 45 years of experience, Trevor Todd is one of the most esteemed estate litigation lawyers in British Columbia. As estate litigators, we meet people who have been disinherited by their loved ones every day. Often times it isn’t about the money. Disinheritance cases can be fueled by family misunderstandings and heartfelt emotion that leads to a contested will. If you’ve been disinherited, there’s still hope. 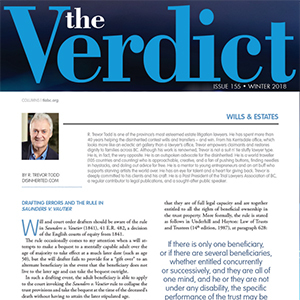 Not all wills may be valid, or if it is valid, it may be varied. Wills sometimes reflect old misunderstandings, abusive attitudes, or improper influence. Where there is due course, wills and transfers can be successfully challenged in court. Do You Need Advice on a Contested Will? With a keen sense of curiosity and creativity, Trevor has become one of the most successful estate lawyers in the business. He gives his initial advice for free. If you’re been disinherited or are considering contesting a will, contact Trevor today at his Vancouver office.